An American church posted this message on its exterior billboard in late March, and has since gone viral across social networks, and p**sed off a lot of Christians on its way. Many people who call themselves Christians would not like to hear this because they are the chief hate mongers. They judge others every second and find them wanting and therefore not worthy of God's love. Yet like the pastor says, this is the message of the Good Samaritan parable. Jesus was not foolish when he added those considered holy at that time to the message. Bottomline, if you call yourself a Christian, don't perpetuate hate. Valerie I love your wisdom, really a hateful Christian does not exist. But I get pastor Tate's drift sha. As I'm not in God's head I do not know what to think. He has said our ways are not his ways. But really its disconcerting watching "hateful Christians". 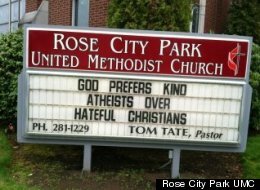 Hate is ungodly, God's children aren't hateful so when u think about it "hateful Christians" is an oxymoron. They might as well be athiests who don't believe there's a God… That said, I really don't think God prefers one category to the other. Because Christians ARE NOT hateful.